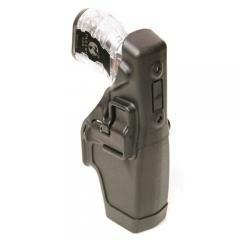 The Blackhawk TASER X-26 SERPA Duty Holster is a secure carrying option for the X-26 electronic discharge weapon with optional camera unit attached. When placed in the holster, the automatic lock secures the weapon in place to prevent it from falling out or being snatched. It is automatically disengaged by the index finger when the TASER is drawn with a master grip, so it won't slow down your draw when a fast reaction time can be the difference between life and death. The holster's rigid body provides additional security, and the bottom is designed to block the probes in order to stop accidental discharges. The holster can be equipped with a cartridge carrier and is compatible with all SERPA accessories, allowing you to mount it on S.T.R.I.K.E. platforms and shoulder or thigh rigs. It is made from durable carbon fiber, in a high-coverage design that protects the trigger and trigger guard. Excellent product, Blackhawks reputation holds true. Love these holsters, easy access to non-lethal options. Excellent functions great for my duty belt. Excellent product. Easy configuration, simple to use and easy to get use to. Highly recommend. Not bulky, ajustable and just works. Perfect fit for the X26. Also offers options to ware the Taser on the duty bely or on the Blackhawk thigh rig. Up or down left side or right, great buy. It's works out fantastic. I use it on duty at all times. Great product holds my x26 duty taser perfectly snug but releases quick if in need. Great Holster, works great, sits good on my belt. Big improvement over my old one.